We meet the affable architect Erric Chew at his bungalow office located on a main thoroughfare in Seapark, Petaling Jaya. Opposite the office’s back gate is a contemporary bungalow that he designed for himself and his family. 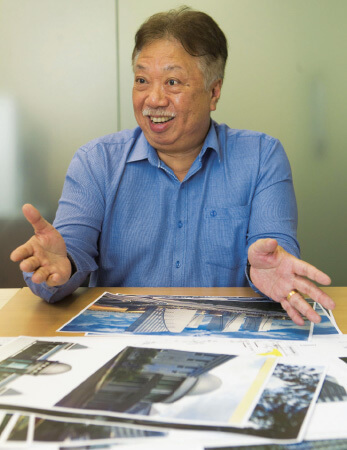 Having been in the architecture industry for over 30 years, Chew has built a solid portfolio of projects — mainly large-scale residential and commercial developments. He is currently the managing director of his namesake sole proprietorship Erric Chew Architect. 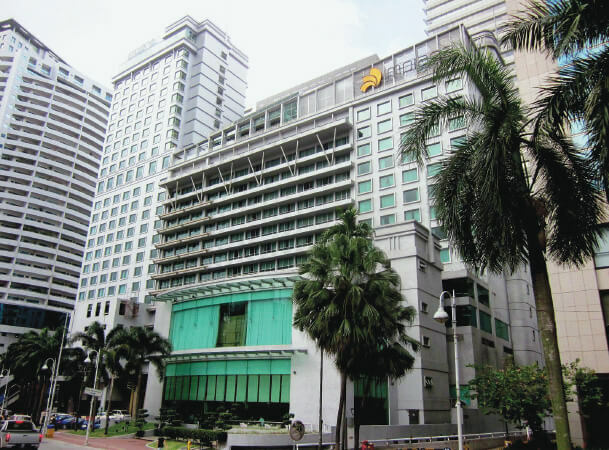 The developments he has worked on include the Impiana KLCC Hotel in Kuala Lumpur, Centrepoint office towers at Mid Valley City, Kuala Lumpur, the JW Marriott Medan in Indonesia, The Northam All Suite Penang, The Gurney Resort Hotel and Residences and 8 Gurney (The Shore) condominium in Penang. “We concentrate on larger-scale commercial and residential projects. A lot of our jobs are fairly large, with many from repeat clients. We have not really done terraced housing but we have done several individual house projects for friends,” Chew tells City & Country. “We are lucky to have been able to work on sizeable projects as there is an economy of scale and we are able to manage our limited resources more effectively,” he says. His latest project is a repeat client IGB’s Mid Valley Southkey in Johor. Phase 1 comprises five levels of shopping with a gross floor area of 5.3 million sq ft, four office towers with a GFA of 1.8 million sq ft and two hotels with a GFA of 840,000 sq ft. The 22-acre Phase 1 is in the final stages of construction. Chew will move on with Phase 2 of the development, which will comprise another shopping mall and two tower blocks. He says the Southkey development is designed to be fully integrated across all components, such as the hotels, shopping and offices. “Southkey’s Megamall concept will be similar to that of Mid Valley Megamall in Kuala Lumpur. It will be integrated as well as function and leasing-oriented. We have included a main thoroughfare, or internal street, with the three courts — North, Centre and South — to give people moving through the building a sense of where they are in the mall,” Chew says. He says Southkey’s traffic dispersal design is an important concept of the mall. “Traffic will be dispersed through the basement and elevated car parking levels via multiple entry points. Vehicles coming from Singapore can also go directly into the building from an elevated highway,” he says. The tower blocks at Southkey are placed on the periphery of the mall so people being dropped off can immediately access the lift lobbies, he adds. Of all the projects Chew has worked on, his personal favourite and most memorable project remains the 50,000 sq ft Read Masonic Centre in Bukit OUG, Kuala Lumpur. It is where the Freemasons gather and hold their activities. “This building is close to my heart as a lot of work went into it. Getting approval from authorities was tough but we managed in the end,” he says. The centre is designed to be contemporary and visually dramatic yet function practically. The overall building plan was created as two intersecting rectangles, resulting in a cruciform shape, with emphasis on the four points of the compass as gates or entrances to the building. According to Chew, Freemasons enter the building via the main porch in the east, which is highlighed by a large pyramid structure on the top, while visitors enter from the west. Masonic symbols — the square and compass — have been incorporated in the porch of the main entrance, facing the morning sun. The entrance porch also has two pillars to symbolise “establish” and “strength”. Upon entering, visitors pass a list of past members framed along the walls. Along this gallery is inscribed the “twenty-four-inch gauge” — 24 equal lines, 12 on each side of the main axis, to represent time well spent. At the end of the gallery is the inner sanctum, with the main lift lobby and point of circulation. There are two glass lifts that represent “the pillar of cloud by day” and “the pillar of fire by night”. To the west is a winding staircase that starts at the grand lobby leading up to the main temples and banquet hall. A dome and water feature at the western end of the building represent the “canopy of stars” and “deep blue sea” respectively. A large pyramid structure also forms the roof over the main function hall to emphasise the space’s significance as the main venue for functions while the ceiling height is intended to draw the viewers’ eyes upwards towards the centre of the pyramid. The three lights of Freemasonry are represented as three pyramids on the roof of the building. The tops of the pyramids, where light filters through, represent the on­going Masonic activities in the three temples, says Chew. Spaces in the building are located according to Masonic significance. For instance, the library and archives are in the northeast corner of the building, also known as the repository of knowledge and foundation for knowledge, whereas the kitchen and dining areas are located in the “festive south”. Chew takes pride in his team. “We are a small but effective firm and work as a single cohesive unit. We pride ourselves on being able to deliver buildings on a lower budget based on the same design criteria. As for the increasing number of foreign architects coming in, Chew is not worried. “We are on par to work with them. Some foreign architects bring in a lot of new technology and new ways of doing things. We can learn a lot from them. “That said, most of the jobs we receive are from people we know. We end up being good friends with a lot of our clients... and as opposed to big firms, we are there to see the clients through rather than pass the jobs on to other project architects to handle,” he concludes.